Now that Thanksgiving is over, I am going to start my focus on our next big holiday, Christmas. I have joined a group of bloggers led by Beth at Living Life Intentionally to present Christmas Around the World. Each day a different blog will feature what Christmas or a winter holiday is celebrated in a different country around the world. This amazing event starts today! My post will be on December 10th. To check out all the amazing posts, just click the links above!! 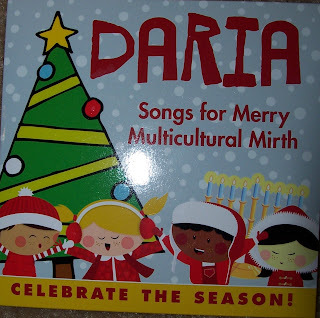 Daria was kind enough to send me her holiday CD to review here. Now this CD is not a Christmas CD. It is a World Holiday CD. The difference of course being that it does not only have Christmas songs. Now my favorite part of this CD is that on the back she gives a little information/history of each song. The CD has five songs on it. Two are Hanukkah songs: one from Spain and one from America. Then there are two Christmas songs: Feliz Navidad and a German song with an English verse added and finally it has a version of Jingle Bells with the history that it is actually a Thanksgiving song. So if you are looking for a way to celebrate the season and not just one holiday, check out this great CD. You can purchase it here! I should also add that we love her other CD's as well or at least the one we have. Also, if you should check out her Monthly Song Newsletter. It always has amazing giveaways, songs, and crafts. November she is celebrating Native American Heritage Month and has some amazing ideas there. I also wanted to share with you some of the Christmas books we have found and love! Of course several are from this month's author for the Virtual Book Club for Kids. You can check out the blog hop for some ideas to go with a few. The first is The Story of Mary by Patricia A. Pingry. This is a book I picked up at a discount store a few years ago, but we love it. It tells the story mostly from Mary's view and sticks pretty close to the Bible, but is in a way that Hazel has always loved. 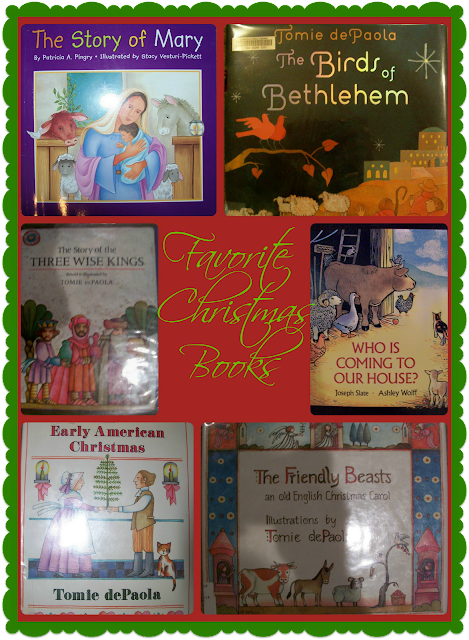 The second is The Birds of Bethlehem by Tomie dePaola. 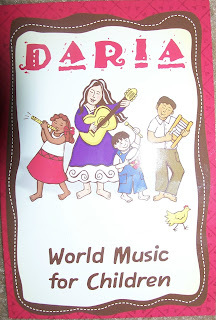 This is the newest book by dePaola (and I know there are some posts in the blog hop on it). This story is about the birds discussing the different things they saw in Bethlehem the day before which of course was the first Christmas. The third is The Story of the Three Wise Kings by Tomie dePaola. This book tells the story of the three wisemen in a way that children like to follow. We really enjoy it! The fourth is Who Is Coming to Our House? by Joseph Slate and Ashley Wolff. This story is about the animals in the stable getting ready for their special guests on Christmas Eve. The fifth is An Early American Christmas by Tomie dePaola. This story is about a small New England town where no one has Christmas trees, puts candles in the windows, or sings Christmas carols until a family from Germany and Pennsylvania move in. They make bayberry candles to put in the windows to light the way for the Christ child. They have a Christmas tree and sings Christmas carols and soon their neighbors start doing the same. This is one of Hazel's favorites! The final one is The Friendly Beasts: an Old English Christmas Carol illustrated by Tomie dePaola. This English carol is about the roles the animals played in the stable to assist with the new baby king. So here is our Black Friday post. I hope you will join us for the various events mentioned (Christmas Around the World, The Virtual Book Club Blog Hop, etc.)! Hi Carrie, What a great project! Just curious, what is the German song on the CD? I wonder if t is one of the ones we sing here in Berlin . . .